In the 21st century, more and more older adults are turning to massage to relieve the pain of arthritis, help recover from surgery or injuries, and maintain flexibility and fitness. Seniors are also finding massage to be an effective support for other therapies such as chiropractic and physical therapy. What’s more, doctors are increasingly referring more of their patients to massage therapists to reduce stress and assist healing. Your body repairs itself throughout your lifetime, but with each year it gradually loses some of its ability to spring back from the wear and tear of daily living. Though this is unavoidable, you can take steps to improve your strength, flexibility, coordination and energy no matter how old you are. Regular therapeutic massage is a supportive and restorative measure you can take to maintain physical and mental well-being throughout your life. 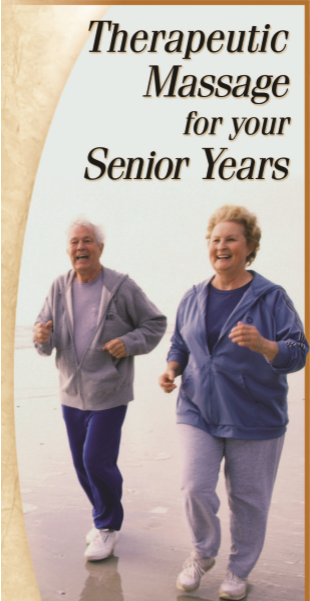 For seniors in particular, this remarkable therapy supports recovery from setbacks as well as resilience in the face of daily stresses. Not only is massage enjoyable, it is beneficial and healthful, especially when received on a regular basis. Communicating your needs. Tell your massage therapist why you are getting a massage so that she or he can adjust the focus to meet your needs. For example, you may want relief for sore feet or tight shoulders, or you may just want to relax. Dress. Your massage therapist will normally leave the room while you undress. You will be covered at all times except for the area being massaged. Tell your therapist if you prefer to leave some or all of your clothes on. Getting comfortable. If you wish, your therapist will help you get on or off the table. Cushions may be used for support. If needed, most massage therapists can work with you seated in a chair. Special concerns. Always tell your massage therapist if the pressure used is comfortable. Indicate if you do not want oil or lotion, or if you prefer them unscented. Tell your therapist if you are hard of hearing. If you are too cold or hot, the heat or your covers can be adjusted. After your massage. Before getting up from the table, give yourself a few minutes to reorient from a state of deep relaxation. Stress not only interferes with your ability to enjoy life, but can also threaten your good health. Research indicates that unrelieved stress can impair the body’s immune system and aggravate many chronic ailments, such as headaches or asthma. Because the effects of stress are cumulative, managing it becomes increasingly important with age. Therapeutic massage can result in a deep sense of relaxation, which for many people is reason enough to have one. Massage calms the nervous system, relaxing muscle tension and allowing anxiety to fade. With regular massage therapy you can even improve your ability to relax on your own. This can translate into increased energy for daily activities, more patience with life’s minor irritations, and a renewed enthusiasm for daily living. should be avoided, or at least cautiously done. Always inform your massage therapist about changes in your health, even minor ones. In some cases, your massage therapist may ask permission to contact your physician for more information. The more often you receive a massage, the more benefits you are likely to notice. With experience, you and your massage therapist can set a schedule that is best for you.